Since I can't really have a physical one I figured I might as well make one here! Blessing or Cleansing of home: Good results personally from bad spirits in my area. [*] Lord and Lady, guard this entranceway, cleansing all who pass through it. Keep out any and all impurities, that those within this house may be protected by your light and love. [*]	Lord and Lady, guard this room, cleansing all who pass through it. Keep out any and all impurities, that those within this house may be protected by your light and love. [*] Lord and Lady, let your light and your energy remain in all corners of this home, guarding it from any and all negativity. Protect all who dwell in here at all times. ⦁	"I am here to cleanse and purify myself, to obliterate any negativity directed at me, that I may enjoy the peace, love and joy that lie around me." ⦁	"I surround myself with the white light of love and protection. It protects me from all directions: east, south, west, and north. As these flames burn bright and strong, so does the light of love and life burn bright and strong within me, keeping me from any harm." ⦁	"Surrounding me, I build a barrier of protection to support that barrier of light projected by these candle(s). Together may they guard me from any and all negativity now present or at any time in the future directed toward me. I ask this in the name of the Lord and Lady, knowing that in their love I am blessed. So more it be!" Across which no human error dares set its foot. ⦁	Here we send our love and energies to help you pass across the bridge, into the light and into the arms of the Lord and the Lady. May your spirit burn as brightly as does this candle flame. You have touched many hearts in your time with us and we will miss you. Blessed be! ⦁	We wish you all the love and happiness we may. We will always remember you with love. You are always welcome at our circles. Do not forget us. We will meet again. So mote it be. Amber- Fossils from pine tree resin, they add strength to magick and spells, attract love and increase beauty. Aventurine- Increases mental powers, perception and creative insight, gambler's stone. Carnlean - Promotes self-confidence and peace, eases depression. Fluorite- Reduces emotional involvement, used to gain perspective, increase mental power. This has been very successful for me as well as I always get a response. I did find this online and ever since having faith in using them they are successful to me. I call upon you. Hermanubis, I summon you. A follower of the Old Ways calls out to you. for I would traffick with the Peaceful Departed"
Once I open up the portal, gate, etc, I follow with this to ensure the spirits feel comfortable speaking. "I call upon the Peaceful Dead. then be with us now in the sacred space. 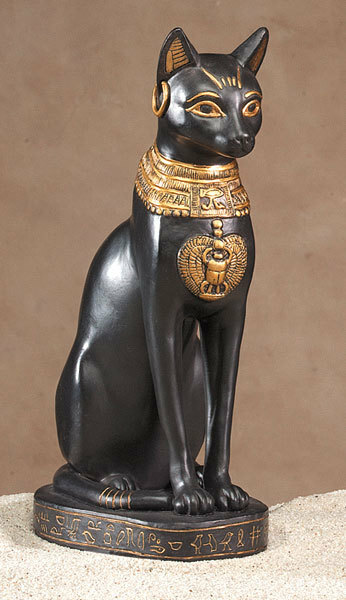 Indicate your presence and readiness by moving the (key) to (place or Yes in my case)"
"Holy Bastet, I cleanse this water of all negativity in this world and in the astral. I consecrate and regenerate this water in the name of Bastet." "In the names of Bastet I ask for the blessings of love, harmony, and peace upon this water. Amen."